Leicester host West Brom on Monday Night Football, and bookmakers expect the Foxes to claim all three points. Fancy Leicester to win? Get a 33/1 price boost at Ladbrokes! Money back if you lose! Leicester enter this clash on the back of a five-match winless run that has left them hovering above the relegation zone on goal difference only. As a result, they desperately need a win! Find below how to back Leicester to beat West Brom at 33/1! Money back if you lose! Join Ladbrokes via our special links and claim 33/1 for Leicester to beat West Brom! 3) Place a single bet of up to €/£1 on Leicester to beat West Brom in the 'Match Winner' market before the kick off. 1. 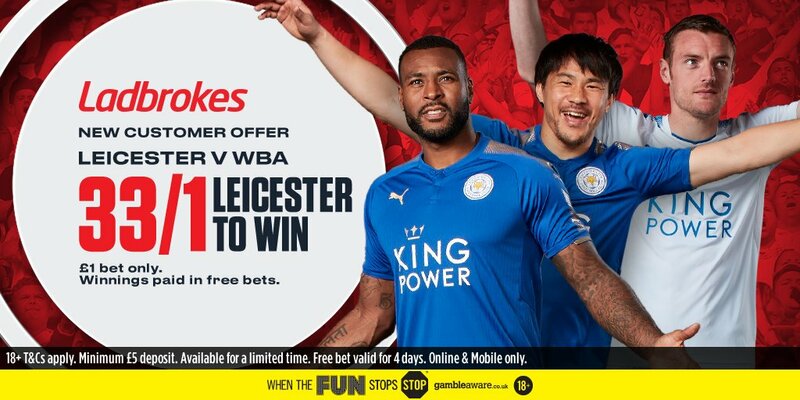 Offer available to new Ladbrokes Online & Mobile customers: Simply register today, deposit a minimum of £/€5, and place your first bet as a single bet of £/€1 on Leicester to beat WBA (33/1). 3. Winning bets will be settled at the standard price and the additional winnings from the enhanced price will be credited to your account within 24 hours, in free bet tokens of £/€5. 4. Free bet winnings will expire after 4 days. 5. Should your bet lose, we will refund your stake up to £/€1 as a free bet within 24 hours. 6. Free bets can only be redeemed via Online or Mobile. 7. Free bets must be used in their entirety and cannot be split into multiple stakes. A free bet cannot be partially redeemed. If you attempt to place a bet for a lesser total stake than the value of your free bet, the remaining value of the free bet will be void. 8. Free Bets are non-refundable. Stakes will not be returned on winning bets placed with Free Bets. 9. Free Bets cannot be redeemed on any other online product; Poker, Casino, Live Casino, Games, Bingo, Lottos, Virtuals, Slots, Exchange or be used to fund Tote or Pool bets. 10. Redeemed free bets will not count toward qualification to view streamed events. 11. Free bets do not count towards qualifying for any other promotional offers. 12. We cannot accept new customers from, or offer this promotion in, certain countries - see here for Restricted Territories. 13. You must be aged 18 years or over to bet and participate in any Ladbrokes promotion. 14. Only bets placed in accordance with the terms and conditions will be eligible for this offer. 15. This offer is not available through Telebetting, Text Betting, or Ladbrokes Exchange. 16. Ladbrokes reserves the right, at its discretion, to exclude individual customers from any Ladbrokes promotions, including Money Back and Free Bet offers. 17. Ladbrokes may determine, at its discretion, whether it believes different entries or accounts are connected to the same person, using whatever methods it deems appropriate. 18. If the terms of the offer are breached or there is evidence of a series of bets placed by a customer or group of customers, enhanced payments, Free Bets or any other promotional offer results in guaranteed customer profits irrespective of the outcome, whether individually or as part of a group, Ladbrokes reserves the right to reclaim the bonus element of such offers and in their absolute discretion either settle bets at the correct odds, void the free bets or void any bet funded by the deposit bonus. 19. In addition Ladbrokes reserves the right to levy an administration charge on the customer up to the value of the deposit bonus, Free Bet or additional payment to cover administrative costs. We further reserve the right to ask any customer to provide sufficient documentation for us to be satisfied in our absolute discretion as to the customer's identity prior to us crediting any free bet or offer to their account. 20. In the event of a breach of these terms and conditions Ladbrokes reserves the right to take such action as it deems appropriate in its absolute discretion. "Get 33/1 Leicester to win vs West Brom at Ladbrokes (MNF enhanced odds)"